(Newser) – Mitt Romney's top strategist goes under the microscope this morning in a lengthy Politico piece, in which insiders dish on a flighty and unpredictable Stuart Stevens, depicting him as a "tortured artist" who many don't much care for. Case in point: Stevens ditched Romney's original convention speech, penned by a longtime GOP presidential aide, eight days before the candidate took the stage at the RNC. He then contacted a pair of George W. Bush speechwriters to draft a new one in days, and again largely scrapped that one. 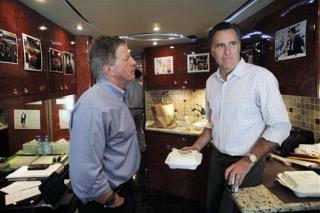 Instead, Stevens and Romney collaborated on the final version; Romney hardly had time to practice. I say Stevens old boy, keep up the good work! You're doing a fantastic job. For the Democrats! Question; who hired the guy in the first place? And what happened to the guy who 'likes to fire people'? If it were Donald Trump he'd have been fired ages ago. When the finger pointing starts BEFORE the loss it's not a good sign.